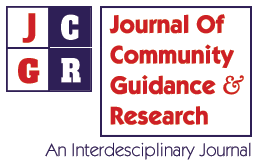 Are you subscribing to the Journal of Community Guidance & Research? The Journal of Community Guidance & Research, a trend-setting interdisciplinary journal, published every four months by Neelkamal Publications Pvt. Ltd., has carved a niche for itself in the field of specialized journals. This journal is approved by Union Grants Commission (UGC), which is one of their listed journals. The Journal of Community Guidance & Research, featuring research articles on diverse aspects of community service has been widely appreciated by the teaching fraternity as well as research workers. In fact, it has become one of the oft-quoted journals in research writings. With this journal becoming one of the sought after journals in the research arena, can you and your faculty members deny yourselves an opportunity to be in touch with the trends in the area of community service? It would be no exaggeration to state that the journal will contribute immensely to the intellectual capital of its readers, whether they are associated with educational institutions, voluntary organizations or corporate houses. The rich content of the journal will more than compensate for the subscription amount, which is Rs.1500 per annum. In other words the journal provides real value for money. Can one ask for more? The three issues of the journal published every year in March, July and November, will be packed with content that would be hard to resist. Any library or individual, who is serious about enriching the resources of his or her learning resource center or library, would find the addition of the Journal of Community Guidance & Research a welcome one. Can you afford to be left out of the exclusive league of the readers subscribing to the Journal of Community Guidance & Research?